A lunar eclipse will be visible over much of the Earth on July 27, 2018. 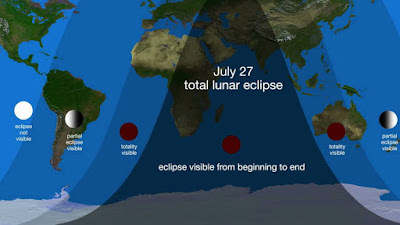 At least part of the eclipse will be visible in all major land areas except North and Central America, with totality visible in the the Middle East, India, parts of central Asia and eastern and southern Africa. When will The Blood Moon (Lunar Eclipse) Begin? The eclipse will start 1:14 p.m. EDT (17:14 Universal Time, or UTC), with the moon fully eclipsed between 3:30 p.m. and 5:13 p.m. EDT (19:30 and 21:13 UTC). It will end at 7:28 p.m. EDT (23:28 UTC). When Does A Lunar Eclipse Occur? A lunar eclipse occurs when the Moon passes through the Earth's shadow on the opposite side of the Earth from the Sun. What is Special About Today's Eclipse - Blood Moon? 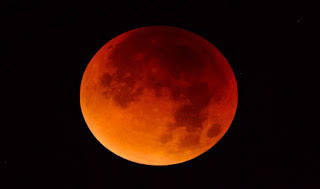 What is special about this particular eclipse is that it will change the color of the moon to a reddish color. It will be the longest eclipse of the 21st century. The longest in 100 years! For about half the world, the moon will be partly or fully in Earth's shadow from 1:14 p.m. to 7:28 p.m. ET six hours and 14 minutes in all. The period of complete eclipse known as "totality," when the moon appears darkest will last from 3:30 p.m. to 5:13 p.m. ET. "Totality will last for 103 minutes, making it the longest eclipse of the 21st century!" said the Royal Astronomical Society in London. At the same time that the longest "blood moon" in history is happening, Mars will be only 35.9 million miles from Earth. According to experts, this is the closest that the "red planet" has been to Earth in 15 years. NASA TV will carry live views of the eclipse from approximately 2:15 p.m. EDT (14:15 UTC) until as late as 6:30 p.m. EDT (18:30 UTC).